I am able to attribute these chairs to Georges Jacob, one of the most important furniture makers in Paris under Louis XVI, the various governments in between, and Napoleon Ist. 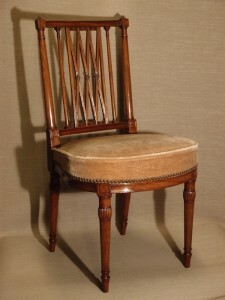 Part of the reason Jacob produced such successful chairs is his use of mahogany, a dramatic innovation for a joiner. As a rule, 18th century French furniture making was divided into two main lines that seldom overlapped. Menuisiers made things that were essentially sticks joined together, such as chairs, tables and carriage frames. The English term is joiner. The Ebeniste made boxes: case furniture such as chests of drawers, bookcases, cupboards, where crucially, large flat areas existed that could be enriched with a veneer of expensive wood, ivory, tortoiseshell etc. The name derives from the fact that the first French veneering used ebony. The English equivalent term is cabinetmaker. In consequence, the few chairs made by ebenistes are usually horrible, stiff and clunky, a sad contrast to the fluid elegance of the great menuisier’s work. While mahogany, acajou, had been used from the early 18th century by the ebenistes, the menuisiers almost exclusively used walnut and beech until the Revolution. Jacob’s almost exclusive use of mahogany for chairs allowed him to develop styles of great refinement, as mahogany is more robust then walnut or beech. In addition, there is a constructional peculiarity. The pegs used to secure the tenon in the mortise are tiny and round, which the density of mahogany made possible. These tiny round pegs became commonplace from the Empire period, possibly because mahogany became the favoured wood at that time for chairs. These small pegs are already typical of the work of Jacob in the 1780s. As my chairs are mahogany (and the right kind of mahogany), this is evidence in favour of an attribution to Jacob. Unfortunately, the chairs are not signed. All furniture made by recognized artisans under the Louis XV and XVI was signed, but only four chairs in ten might bear a stamp in a large set, so unsigned chairs are not unusual. While a genuine Jacob stamp would prove their authorship, we can still be 99% certain of their maker, taking other evidence into account. These trellis back chairs are in the English style. Jacob made the first chairs a l’Anglais for the Duc de Provence In 1785. This fashion would have immediately spread. Parisian aristocrats were not keen on having last year’s fashions, even in furniture. The chair leg on my chairs was typical of only Jacob, and this leg with the little ribbed pumpkin motif is actually known as a “Jacob leg”. The clinching evidence is to be found in an unusual constructional detail. When the chairs are upturned the curved seat rails and the straight back seat rail have been reduced by having material scraped away, first with a chisel and then with a spokeshave. This has not been found in chairs that are later copies. Moreover, this strange reduction of material is peculiar to only five furniture makers: Jacob, Boucault, Foliot, Sene and Nogaret. These trellis back chairs are in the English style. Jacob made the first mahogany chairs a l’Anglais for the Comte de Provence in 1785. This fashion would have immediately been copied. Parisian aristocrats were not keen on having last year’s fashions, even in furniture. So the chairs are C1790, Paris made, with the curious cutaway to the seat rails, are mahogany, have tiny, round pegs, and are an Angloform design characteristic of Jacob, and have the Jacob leg. I think we can reasonably attribute these to Georges Jacob. Christie’s (London) sold a very similar pair in 18 Nov 2010, previously from the prominent dealer Partridges. One of them is signed and they demonstrate the Jacob leg, trellis back and horseshoe seat. ← Superstar Actress dies at 30, head stolen!